Whether you are trying to find tree removal costs or are just looking for general tree care service information, then you've come to the right place! Here at CVS Home we've done extensive research on tree removal, trimming, pruning, stump removal, grinding and all tree care services. This guide will give you all the information and tips that you need to help you choose the right tree service for your next home project. It's important to follow the information in this guide, as choosing the wrong company (or even worse trying to do a job that you can't handle on your own), can have terrible results that can not only reduce the value of your property but more importantly, can be extremely dangerous. Whether you are trying to cut down a tree to plant some new ones, or there was a large storm and you need to remove a tree for safety reasons, it's important to know what's involved in the process. 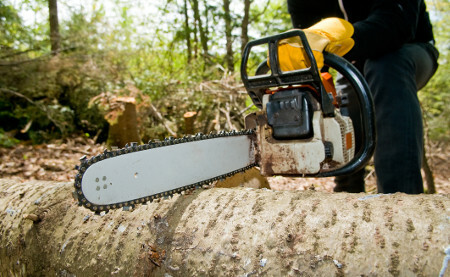 One thing that you must be aware of is that there are many companies that claim to offer tree removal services, but they don't necessarily have the skills or the right equipment for the job. It's always a good idea to choose an established tree cutting service that has at least a few years experience in your area. Depending on where you live, you may need to get a permit from your local city government (sometimes homeowner's associations require this as well) before you can get rid of a tree. Your local arborist should know both your city and neighborhood rules, and also be able to get the permit for you for a small fee. Tree is either chopped down piece by piece and lowered to the ground by a rope if you are in a residential area where it's not possible to chop down the entire trunk. If it's in a remote area the entire tree may be cut down and then chopped into pieces once already on the ground. The first option is usually a little bit more expensive as it's more difficult to cut it off piece by piece while suspended in the air. While it's slightly more expensive, it's also the only option in many cases. Do I need to remove the tree for safety reasons? If your tree currently presents a safety hazard the you should call a local expert and get it taken care of as soon as possible. Arborists are usually very busy after heavy storms or wind and it may take a few days, but the sooner that you call, the sooner you can fix the problem. It costs $250 to $500 to remove a small tree in most cases and $400 to $999 for an average sized tree and more than $1,500 for large trees taller than 75 feet. Removal costs depend on various other factors as well, and you can find more detailed information about prices below. Can you get rid of a tree that's already fallen? Yes, under most circumstances all of the tree companies near you will be able to take care of a tree that's fallen. You may run into issues where the tree has fallen on some electrical wires or on a home. In these cases it's important to stay away from the fallen tree and the damaged area. If there are electrical or telephone wires damaged, you may need to also call out an electrician or another specialist, but a good tree company will take care of this. How long does it take to remove a tree? Typical jobs only last a few hours and larger trees may require a full day. How long it takes depends mainly on how many trees, how tall they are, and where they are located. Can't I save a ton of money with d.i.y. tree removal? While it may seem expensive at first, you have to remember that it takes a lot of skill and training to perform these jobs. Not only that, but the biggest reason to leave it to the pros is due to the dangerous nature of tree removal. Even the experts who have years of experience and the best equipment are required to have insurance and training. If you are set on removing a tree yourself, you can find more information about safety tips here. Up to 30 feet tall. 30 to 60 ft. high. Trees that are 60 to 80 ft. tall. 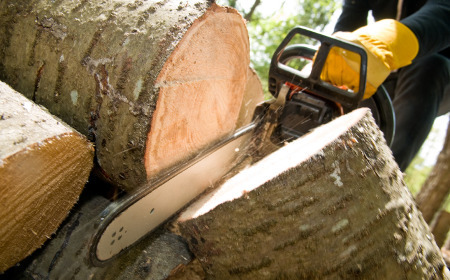 Size - height of tree is one of the biggest factors that affect tree removal prices. 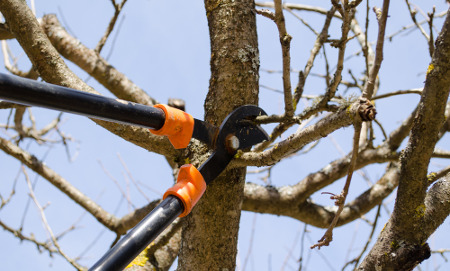 Taller trees are more dangerous to work on, often require specialized equipment such as a bucket truck, and may require that it gets cut down in pieces and roped to the ground which adds a considerable amount of time to the job. Taller trees also tend to have bigger, thicker trunks and more branches. 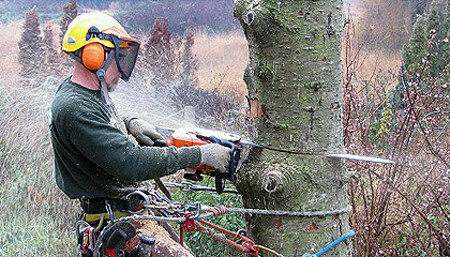 Condition - the condition of the tree will play a part in determining how difficult the job will be. If a tree is damaged or diseased, it may actually be easier to work on since it may be brittle and easier to cut down. If a tree is in good health and has a very strong trunk, it may take longer. If the tree has multiple trunks or it is leaning significantly to one side or the other, it presents more challenges and will take longer and also cost more. Trunk Diameter - the wider the trunk, the more expensive it will be to cut down. Not only will the tree be much heavier, but it's also likely to be taller. Since trees often have to be removed in small pieces, a larger trunk adds a significant amount of time to the job. Trunk diameter is often a bigger factor in pricing than tree height, as it's often times easier to cut down a tall tree with a small trunk. Age - the older a tree is, the more difficult it is to remove in most cases. If you are removing the whole tree including the trunk and roots, then older trees will take much more time. Older trees have large, extensive roots that need to be removed and can take much longer than a new tree. Type - it costs around $350 to $450 to remove a 40 ft pine tree and up to $1,400 for an 80 foot one. 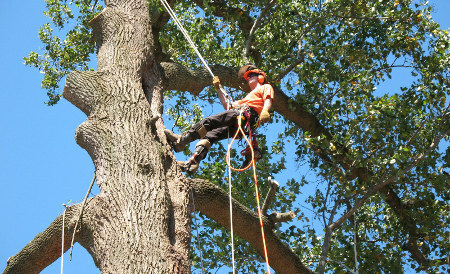 Oak tree removal costs between $300 to $950 due to their strong trunks and relatively tall heights. Palm tree removal costs around $200 to $500 for smaller ones that are less than 30 feet, but can cost more than $1,000 for palms taller than 80 ft. As you can see, pricing ranges widely depending on the species and type of tree you need to remove. Location - the location of the tree can have a large impact on how long and how much the job will cost. The ideal situation is to have a tree in an area that is in an open, clear space with enough room to fell the entire tree. Then once the tree is on the ground it's much easier to chop it up into smaller pieces. Your project will cost more if it's located next to a house or other structure, power lines, phone lines or if it's in an area that makes it difficult for a bucket truck to reach. **If you need to get rid of a tree due to weather damage, keep in mind that it will cost substantially more if you have a tree that's fallen on a home or other structure, power lines or phone lines. The increased costs are due to the complexity of the job and it will take much longer to ensure that no additional damage occurs during removal. These jobs are higher risk, more dangerous, require more workers, and often require a crane or other equipment. Tree Trimming - Hire an Expert or DIY? 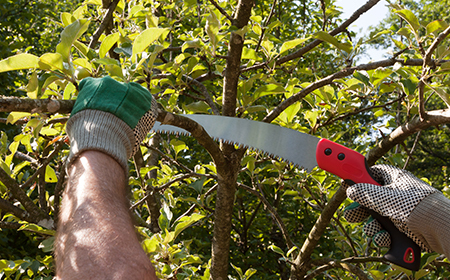 Expertise - experts know the best time to trim a tree, the right equipment and methods to use, and what will look best. This is a skill that takes years to master, and you want your yard looking it's best. It's Dangerous - this is by far the biggest reason to hire a pro. Hundreds if not thousands of diy tree trimmers get injured every year. Not only do they not invest in proper safety equipment, they do not have the experience or training to safely perform the job. You Need Specialized Equipment - renting or buying all the necessary equipment isn't cheap, especially if you need to rent a bucket truck or a chainsaw. It Takes a Lot Of Time - trying to learn how to trim a tree, getting the equipment, researching rules and regulations and actually completing the job requires a ton of time. Safety - overgrown trees often present dangers to homes and buildings, power lines, phone lines and many other things in their general vicinity. Thousands of people are injured and there's millions in property damage every year from fallen branches, so it's best to take care of small problems before they turn into large ones. Appearance - having professionally trimmed trees can transform your property and increase curb appeal in a big way. Whether you are looking to sell your home and are trying to get the best offer, or you just want to have a property that you enjoy, trimming is an easy, affordable option. 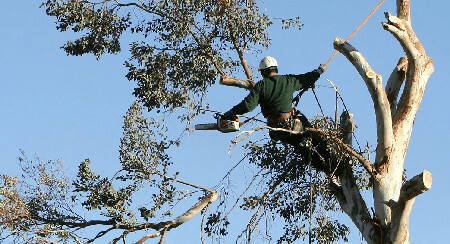 Branches, limbs or leaves that are blocking a view are also one of the biggest reasons people hire tree thinning or trimming service. Tree Health - since diseases can spread throughout your yard, it's important to stop them before they start by getting rid of infected branches. Some trees are more healthy when they get more sunlight or have more room to breathe. Tree pruning techniques such as crown thinning, crown raising, and crown reduction can have dramatic impacts not only on the health but also the appearance of your trees. Tree trimming prices range from $99 to $500 for smaller trees less than 30 feet tall, $140 to $750 for trees between 30-60 ft, and $199 to $975 for trees taller than 60 feet. Costs depend on the type of tree, where your trees are located, how often you need service, and how many trees you have. The more often you get service, the easier the job will be, so on a per job basis your costs will be lower. Your per tree cost will also be lower when you have many trees, as economies of scale come into play. Trees that are 60+ ft. tall. How often do I need tree trimming service? Most people get service once a month, but this depends on your personal preference, the type of trees you have, their age and where you live. If you live in a region with strong winters, you may not need service for a few months. Do I need a permit to trim a tree? Permit requirements vary from city to city, and you local expert will know all the rules and regulations. If you have an HOA or homeowner's association they may require you to get approval. One thing to keep in mind is that if the tree is not on your property (maybe the tree has branches that hang over to your property), you will most likely have to contact the owner of the property and have them take care of the issue. The permitting process is usually fairly straightforward, fast and easy and the company that you hire should take care of it. Many customers assume that when they hire a company to remove a tree, the stump will also be removed. This typically isn't the case and stump removal is usually an added service that you will have to pay for. Removing a tree stump can be a difficult task and add a great deal of time to your job depending on the age, condition and the tree roots. Appearance - they are an eyesore and you can increase the value of your property by getting rid of them. Frees up space - having a bunch of stumps in your yard can take up a ton of space that you can use for other things. Safety - stumps and their roots can damage other landscaping, sprinklers, plumbing, and electric wires. What to do with your removed trees or stumps? Many customers who are getting a tree or stump removed for the first time are surprised to hear that recycling and removal isn't included in the cost. Some cities do not allow disposal of stumps or trees and you may need to chop it up into pieces or rent a wood chipper. Another option is to pay to have the trunk chopped into firewood, which typically isn't very expensive. When obtaining a price estimate be sure to ask if it includes recycling or disposal of the waste. How long have you been performing tree services near me? Choosing a company that has experience working in your area is crucial. Different regions have different types and species of trees, different soil, different weather which all affects the outcome. Have you completed any similar jobs? You never want to hire someone who hasn't performed a similar job. Don't try to save a few dollars by hiring the cheap, inexperienced company, the results can be disastrous. Do you have a list of references or previous clients that I can talk to? Speaking with a few of their past clients will give you an idea of the type of service they will provide. If they can't provide you with any previous clients that are happy with their service, then you should steer clear and look for another company. What equipment are you planning on using for the job? Asking them a pointed question about their techniques will give you a general idea of their experience and skill. Has there ever been any incidents of property damage with falling trees or limbs? You should be wary of any company that has caused property damage during any of their jobs. If it's happened to one of their past customers, it can happen to you. You only want to hire companies that have liability insurance and worker's compensation. If you find a company that has an estimate that seems too good to be true, it probably is, and they probably don't have the required insurance for the job. What happens if the job takes longer than anticipated? If a project takes longer to complete, you want to know if you will be on the hook for the added labor costs. Will you provide a written estimate for the entire job? Having an estimate in writing can save you from many of the hassles that come with hiring small contractors. You never want to get into a "he said, she said" argument, and a written estimate can help you avoid it. Are you responsible and liable for all necessary permits? You don't want to have to research and apply for all the permits for your job. It's also important to choose a reputable company, because if they don't get the permits you could be fined by the city. Do you offer free on-site consultations? Getting a free on-site estimate is the best way to ensure that your job won't go over budget, and you know exactly what you are getting yourself into. How can I pay for tree removal service? You need to figure out if you can pay by credit card, check, cash, invoice, or any other method. When do I have to pay for the tree care services performed? You want to stay away from companies that require the full payment up front. Most companies require you to pay 20-50% of the project up front then the rest once it's been completed. There have been stories of con-artists taking a full payment up front then skipping town...just one of the many reasons experience and company history is important. Are you an ISA Certified Arborist? You want to make sure that you work with a local expert that is certified by the The International Society of Arboriculture. If I get a better price from another company, will you match or beat their rate? Many companies will beat their competitor's pricing if given the chance. You may be required to show proof of an estimate from their competitor. If you've made it this far, then you shouldn't have any problems with your next project. If you'd like to get a price quote from a few of the best local companies in your area, simply complete the online request for quote and you will be contacted by the top experts via phone or email. If you follow the information and tips in this tree service guide, then you can get the best price from the right company for your job!